Tucked away on a quiet block in the Lower East Side, the Henry Street Settlement, which dates back to the late 1800s, offers a glimpse into New York City's past. But over the last year, the Settlement has been moving into the 21st Century, embarking on a groundbreaking plan to becoming the first green landmarked building in NYC by sustainably retrofitting its three historic townhouses. The organization is now competing with 39 other sites for grant money from the Partners in Preservation program, which would help the Settlement complete its upgrades and preserve a piece of New York's history. Henry Street launched its green renovation last year, working with the Municipal Arts Society (MAS) to create a plan that would allow the Settlement to upgrade its aging buildings, built in 1827, on a budget. The goal is to create a model, complete with a comprehensive handbook, that will allow other small businesses to retrofit their properties without breaking the bank. Architect Michael Kriegh of the Pratt Center is leading the project, which began with a series of energy audits from ConEd, NYSERDA, and a private energy auditor. From these audits and consultations with several other green building experts, Henry Street and MAS identified the most important issues. Topping the list is the need for a more energy-efficient heating and cooling system. Old buildings are notorious for inconsistent, energy-hogging heating systems, and Henry Street, like most old NYC buildings, has ill-placed radiators that make it impossible to easily regulate the temperature. New lighting is also a top priority, and ConEd recommended upgrading the interior fixtures and swapping inefficient incandescent bulbs for compact-fluorescents. On our recent visit to Henry Street, we saw that this simple step has already been taken by the Settlement, as spiral CFLs were visible in many of the fixtures. Additionally, ConEd suggested installing motion sensors so the lights only come on when someone is near them. Henry Street and MAS also identified the need for greater awareness in employees and visitors about the relationship between energy conservation and personal behavior. They want the process to be fun and educational, so it will improve the overall experience and lifestyle at Henry Street. With these priorities in mind, the group outlined a road map for implementing the changes, using LEED certification as a framework. Short, medium, and long-term tasks were decided upon in categories of lighting, energy, indoor environment quality, site and building exterior, and water. Through the retrofit, Henry Street aims to save at least 25 percent on energy costs, money which would be used to implement the Settlement’s social services in the community. You can help make this happen by voting for the Henry Street Settlement in the Partners and Preservation program, which is giving away $3 million to historic sites in NYC. You can vote every day until May 21st, when the votes will be tallied and the top four sites will each receive $250,000. The remainder of the money will be split between other sites. Stop by Henry Street this Sunday, May 6 for a free block party to celebrate the 145th birthday of Lillian Wald. From noon to 3 p.m., there will be old-fashioned street games, free tours of the Settlement, refreshments (including cupcakes! ), music, arts and crafts, and a birthday cake baking contest. See Henry Street’s website for all the details. This post is sponsored by Partners in Preservation. Inhabitat has partnered with the program as a blog ambassador to help spread the word and raise awareness of select historical sites throughout New York City. All opinions expressed here are strictly the author’s. Henry Street launched its green renovation last year, working with the Municipal Arts Society (MAS) to create a plan that would allow the Settlement to upgrade its aging buildings, built in 1827, on a budget. The goal is to create a model, complete with a comprehensive handbook, that will allow other small businesses to retrofit their properties without breaking the bank. The Henry Street Settlement was founded in 1893 by Lillian Wald, a pioneer in social work and public health. Henry Street continues her work today with dozens of outreach programs and cultural services. Architect Michael Kriegh of the Pratt Center is leading the sustainability project, which began with a series of energy audits from ConEd, NYSERDA, and a private energy auditor. From these audits and consultations with several other green building experts, Henry Street and MAS identified the most important issues. Topping the list is the need for a more energy-efficient heating and cooling system. Old buildings are notorious for inconsistent, energy-hogging heating systems, and Henry Street, like most old NYC buildings, has ill-placed radiators that make it impossible to easily regulate the temperature. Signs of aging are prominent throughout the Henry Street Settlement. Old windows allow heat to escape, therefore causing wasted energy. Upgrading the windows would allow for a tighter building envelope, saving costs on heating and cooling. Inefficient window air conditioners are used by Henry Street to cool the three townhouses in the hot summer months. Henry Street and MAS also identified the need for greater awareness in employees and visitors about the relationship between energy conservation and personal behavior. They want the process to be fun and educational, so it will improve the overall experience and lifestyle at Henry Street. With these priorities in mind, the group outlined a road map for implementing the changes, using LEED certification as a framework, breaking down the tasks into short, medium, and long-term. The building's exterior site will be improved and upgraded, including the lovely backyard patio, visible here from the porch of an upstairs office. The beautiful hardwood floor in Henry Street's dining room is just one of many preserved historic elements within the Settlement. Through the retrofit, Henry Street aims to save at least 25 percent on energy costs, money which would be used to implement the Settlement's social services in the community. 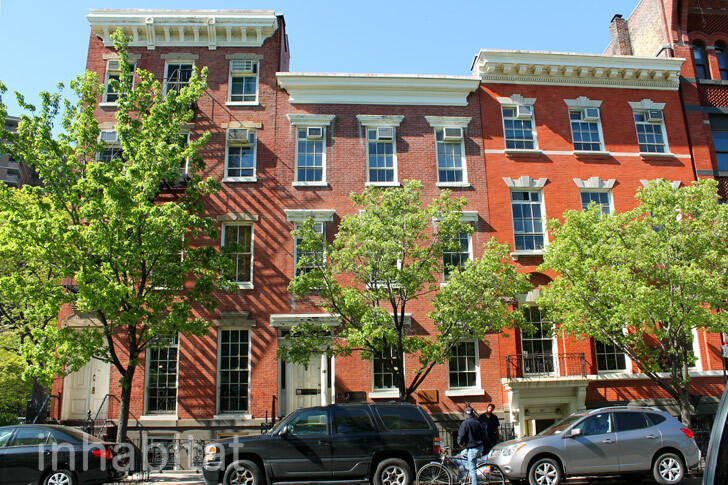 You can help make Henry Street's energy upgrades happen by voting for the Henry Street Settlement in the Partners and Preservation program, which is giving away $3 million to historic sites in NYC. You can vote every day until May 21st, when the votes will be tallied and the top three sites will have their grant requests fully funded. The remainder of the money will be split between other sites.